The story of Fearless is told on the ‘Breaking News’ page of this website. 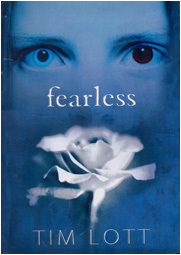 Fearless is a rare attempt to write tragedy for children (although it is also being marketed for adults). It was without doubt the most difficult thing to write I have ever attempted, and I now believe it to be the most accomplished work I have yet produced. Of course, I always think that about a book just before it comes out. But this time I think it’s actually true. Fearless tells the story of a girl, Little Fearless, who is confined in an Institution with 999 other girls. All the girls are graded as either X, Y or Z girls, according to their rank. The X girls are the ‘heavies’ who help run the Institute, the Y girls are the middle group and the Z girls, are the lowest status and newcomers. The Institute calls itself a school, but is more like a labour camp, with the girls sweating 12 hours a day in the Laundry, where the endlessly wash away the stains of the residents of the City, who take advantage of the cheap labour the Institute provides. The Institute is on the outskirts of a City where chaos reigns. Terrorism is everywhere. The City Boss is attempting to capture the leader of the terrorists, the sinister Oroborous. Meanwhile, the Ten Corporations and The City Boss keep the City under strict surveillance and draconian rules. Inside the Institute, Little Fearless is at the heart of a group of friends comprising Little Fearless herself, the prophet Stargazer, the joker and gossip Tattle, the dazzling Beauty and the cleanliness-obsessed Soapdish. We first meet the girls after Little Fearless is arrested after being insolent to the Controller in the Sunday Gathering. The Controller runs the Institute with a rod of iron, his will enforced by the bullying X girls – most notably the cold eyed Lady Luck (who makes all her decisions using a silver coin) and the Whistler (who never speaks but only whistles nursery rhymes). Being brought before the Controller, Little Fearless is told some terrible news that means she decides to escape the Institute. And three times she leaves the high walls, with the help of another X girl, Stench, who runs the enormous rubbish dumps in the Institute. Little Fearless goes to the City, where she meets a priest, a policeman and an ordinary City worker in the attempt to tell them what is happening at the Institute. But they all ignore her.